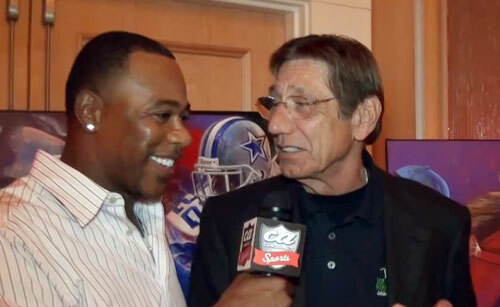 NYC — Jets legend and Pro Football Hall of Famer, Joe Namath, hosted the 10th Annual Joe Namath March of Dimes Celebrity Golf Classic on September 9 & 10 with nearly 100 other sports legends and celebrites attending. Celebrities included Meadowlark Lemon, the ‘Clown Prince of Basketball’, Richard Roundtree, the first black action hero who played “Shaft” and Basketball Hall of Famer Bernard King, to name a few. Heisman trophy winners, Hall of Famers, actors and T.V. stars attended this premier fundraising event that benefits babies throughout Long Island. As the largest March of Dimes golf tournament in the country, this event brings celebrities together to support programs and research that all work together for stronger, healthier babies. Since 1997, over $30 million has been raised for moms and babies due to Joe Namath. 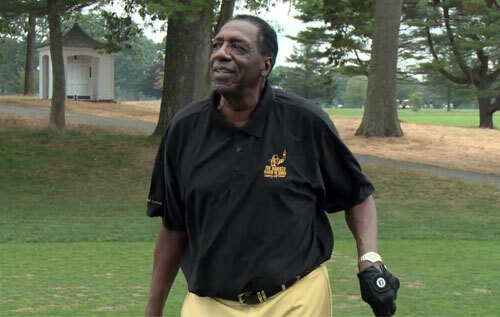 Photo shows former Harlem Globetrotter and basketball legend, Meadowlark Lemon, giving back for charity at the Joe Namath Celebrity Golf Classic for the March of Dimes. Namath was an American Football League icon and played for that league’s New York Jets for most of his professional career, but finished his career with the NFL’s Los Angeles Rams. Namath is best remembered for predicting a win over Don Shula’s NFL Baltimore Colts in Super Bowl III in 1969, which came true. Sports Speakers 360 is a booking agent for pro athletes. If you would like to book Joe Namath for a speaking engagement, appearance or endorsement, contact Joe Namath’s booking agent for fees at 1.855.303.5450.